With the rise in construction and infrastructural developments, there is little space for the bees to pollinate especially in the urban cityscapes. 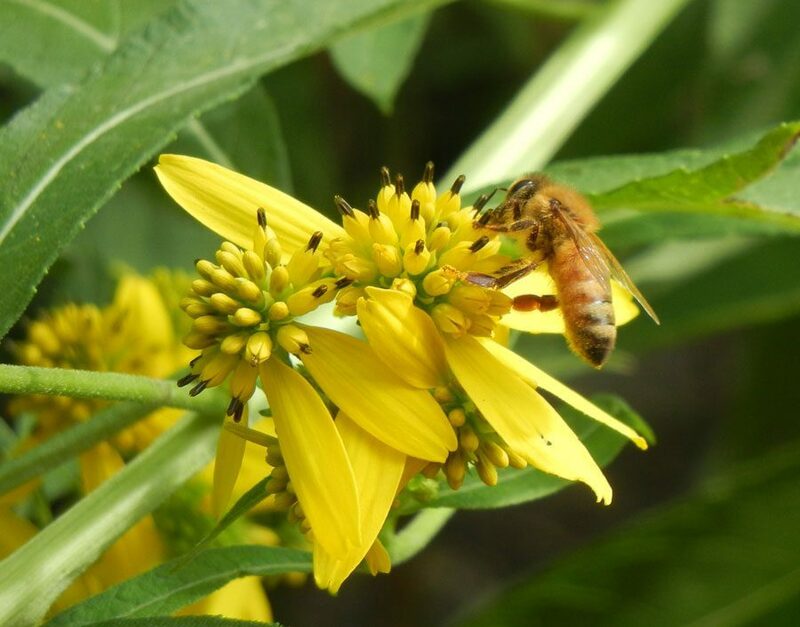 We have much to thank the unassuming bees, for it is through these winged creatures that pollination of almost all fruiting and flowering plants ensue aiding the production of about a third of the food that we consume every single day. But we don’t need to tell you that—these facts are something that all of us have been taught, right from kindergarten. What we really need to be conscious of, and more importantly, be rather worried about is the drastically falling number of the bee population across the world. With the rise in construction and infrastructural developments, there is little space for the bees to pollinate, especially in the urban cityscapes. Source: Indian Creek Nature Centre. Even parks—once a safe haven for the bees to collect nectar and make their hives, are slowly diminishing from our midst. Thus, most of us must have noticed the increasing presence of humongous beehives hanging from the walls of high-rise apartments and residential areas that have gardens around them. Posing as a nuisance for the residents, these hives often meet a cruel end at the hands of pest control authorities. But there have also been instances where these folks have safely handled and transported the hives to secure locations. You can read one such remarkable rescue mission covered by us here. Coming back to the precarious situation of the bees, we tried to understand how we could, as environmentally conscious citizens, make a difference on an individual level. The best option that sprung up was—Beekeeping! Beekeeping, as most of us know, is nothing new to humans. In fact, ancient rock depictions suggest that we have been collecting honey from wild bees almost as early as 10,000 years ago. Alongside, there have also been records of domestication of bees for honey and other purposes in North Africa and Egypt thousands of years ago. The typical definition of beekeeping is the maintenance of bee colonies, commonly in man-made hives, by humans. While scores of farmers and honey suppliers across the world have been engaged in this field for quite some time now, rising concerns over the dwindling number of bees has propelled many individuals to partake in beekeeping as a measure to save these winged beings. And the best part is that, even you can take up beekeeping and that too, right in your backyard! Even better if you’re into gardening, as it relatively takes about the same amount of time and effort to grow your veggies as it does to keep bees. The one big perk of beekeeping in your garden—in addition to producing your own honey and perhaps even selling the surplus—is that it helps your vegetables, flowers and other garden plants thrive. There are numerous factors one needs to consider before heading out to become a beekeeper. Learning from experts. Source: Pune Heritage/ Facebook. Gaining adequate knowledge and training, right from the beekeeping process to areas such as zoology of the bees, bee-human relation and sting management among others, is mandatory. While you might know many practicing beekeepers in your circles, it is better to receive training from the local beekeeping authority. Government organisations like National Bee Board under the Agriculture Department and Central Bee Research and Training Institute (CBRTI) of the Khadi and Village Industries Commission (KVIC) provide training to not just farmers or those who wish to commercially supply honey, but also to anyone who is interested in beekeeping. “For those who wish to pursue beekeeping as a hobby, we have a tailor-made five-day training sessions every month. Accepting only 25 candidates in every batch, we have trained hundreds of individuals including farmers, housewives, students and even retired folks. We teach everything that is required for one to become backyard beekeepers. We only charge an amount of Rs 500 for registration,” says Pokhrey, a beekeeping training expert at the Pune-based CBRTI. In addition to that, the KVIC also has beekeeping extension centres across different locations in the country offering community training sessions as well. A beekeeping training session. Source: KVIC/ Facebook. Primarily started to help rural and tribal communities become economically sustainable in the comfort of their forest or village homes, the government organisation now assists anyone and everyone who wishes to pursue beekeeping seriously and sustainably. Another important factor one must keep in mind is whether your surroundings are habitable for bees. Like we mentioned before, houses in cities that have gardens are perfect contenders for beekeeping, but even those who have kitchen or terrace gardens can give it a try. In case you live in a gated community, it is imperative that not just your family members are onboard with your hobby but also your immediate neighbours. It is possible that they could be allergic to bees, so it’s better to keep them in the loop just to be surel. Who knows, they might also join you in the pursuit. Next comes the crucial selection of site for setting up hive stands or beekeeping boxes. Source: Under The Mango Tree/ Facebook. 1. The ground should be clean and free from dry leaves to avoid fire during summers. One should also pay attention that the hives are set up in areas away from power stations, brick kilns, highways and train tracks. However, these must be easily accessible by road. 2. The site should be open and at dry places that have enough shade. While direct exposure to sunlight must be avoided, the hives should receive early morning and afternoon sunshine. 4. Make sure that there is fresh, easily available running water near the hives, while ensuring there are no sources of stagnant water as well as commercial apiaries, chemical industries or sugar mills nearby. 6. Lastly, the area should be rich in bee flora. While trees like gulmohar (Royal Poinciana), champa (Magnolia champaca) and amaltas (laburnum), and flowering plants like marigold, sunflower, rose, pentas and hibiscus are ideal for attracting bees, even vegetable and fruit plants like ladies finger, onion, mustard, coriander, broccoli, cauliflower, cabbage, carrot, brinjal, tomato, chilli, papaya, lemon, mango, guava and pomegranate, are good at attracting bees. As for the beekeeping boxes, you can either make these yourself through DIY videos or purchase them online. Fortunately, a lot of e-commerce sites these days are selling readymade bee boxes, but make sure you have received ample training and guidance to select the box that meets the needs of your bees. Moreover, beekeeping is no child’s play, so it is important that you are equipped with protective gear and tools. Full bee suit is ideal for heavy-duty work; while on light days, you can make do with simple hats that come with retractable veils to keep errant bees from getting entangled in your hair. You may also like: This Mechanical Engineer Quit His Job to Become a Beekeeper. His Life Has Been Buzzing Ever Since! While we have provided some relevant information on pursuing beekeeping as a hobby, we highly advise you to proceed only with proper training from beekeeping or apiary experts. If you are interested to sign up for CBRTI’s 5-day beekeeping course, the upcoming session is between 8 and 12 April. To register, you can mail them at cbrti.pune@kvic.gov.in or cbrtipune@gmail.com.